Members of the Egyptian parliament's African Affairs Committee held a meeting on Thursday with Coptic Orthodox Pope Tawadros II to discuss the expected role of the Coptic Orthodox Church in furthering Egypt's relations with African countries in 2019. The meeting comes a few days before Egypt takes over as chair of the African Union in 2019. 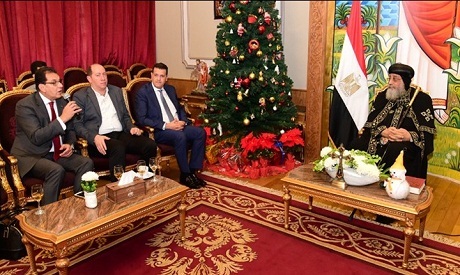 The head of parliament's African affairs committee Tarek Radwan affirmed that the Egyptian Coptic Church has historically played a pivotal and constructive role in Africa, “so we were keen to meet with Pope Tawadros II today to coordinate efforts as Egypt will officially take over as the new chair of the African Union in few weeks." Radwan added that the discussion focused on the influential role of the Coptic Church in Nile Basin countries. "The Church has close relations with these countries, particularly Ethiopia, and we hope that the Church will exercise its vital roles there to serve Egypt's interests," Radwan said. Relations between Egypt and Ethiopia have witnessed tensions over a dam Addis Ababa is building on the main tributary to Egypt’s Nile, which Cairo fears could reduce its share of Nile water. Ethiopia announced last week that the shortage in funding for the dam is expected to delay construction until 2022. President Abdel-Fattah El-Sisi will visit Ethiopia next month to officially take over as the new chair of the African Union (AU) in 2019. Egypt was unanimously elected chair of the AU in January 2018, replacing President of Rwanda Paul Kagame. The meeting with Pope Tawadros II included MPs Hatem Patchat, Mai Mahmoud, Amina Nossair, Sherif Nadi, Hesham Magdi, Maged Abu Kheir, Ahmed Wael, Hamdi Bekheit, and Mona Mounir. Meanwhile, Radwan said that all state authorities, including parliament, are currently working day and night to make Egypt's chairmanship of the African Union in 2019 a landmark year. Radwan, addressing the Arab-African Youth Forum on Thursday morning, deplored that inter-African trade stands at just 1 percent. "It is also regrettable that 75 percent of patients infected with AIDs are located in Africa and that 90 million citizens on the dark continent are infected with Hepatitis C," said Radwan. "So we have tremendous challenges in the coming year and we hope we will be able to meet them, and young people in Africa have a big role to play in this respect," he said. "Egypt will… extend its experience in fighting epidemics and tropical diseases to African countries." The Arab-African Youth Forum is being held in Cairo between 19 and 28 December under the slogan "One Dream…One Objective," with the aim of building bridges of cooperation between Arab and African young people.